This coming week passports will go on sale for the 8th Eastern Pennsylvania Shop Hop. Buy a passport for $5.00 and receive a free block kit, passport with coupons for each shop to be used after the hop, and a tote bag while the supplies last. 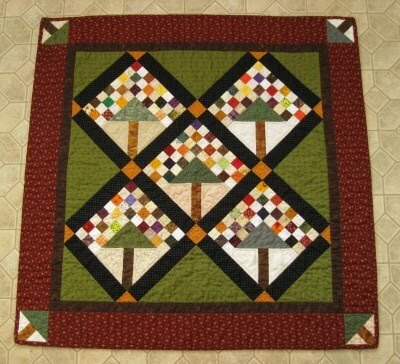 The quilt blocks feature Andover's Charisma Fabric collection by Gail Kessler. Visit 12 shops and purchase additional blocks. This is the tote bag, passport and my block. This is the free block that comes as a kit with your passport. If you get all the shops to stamp your passport you will be entered in a drawing for our grand prizes. The shop hop runs November 6-20, 2010. Have fun visiting all the shops and see 12 different setting options of the blocks to create a stunning quilt designed exclusively for you. 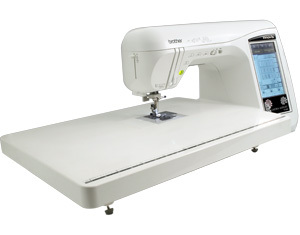 It is like seeing a quilt show at each shop! I hope you can join us for 15 fun days! My DIL, Zlaty made this cute quilt for my grandson, Gabriel's birthday. It is just adorable. I love it! I know Gabriel will love snuggling with it. 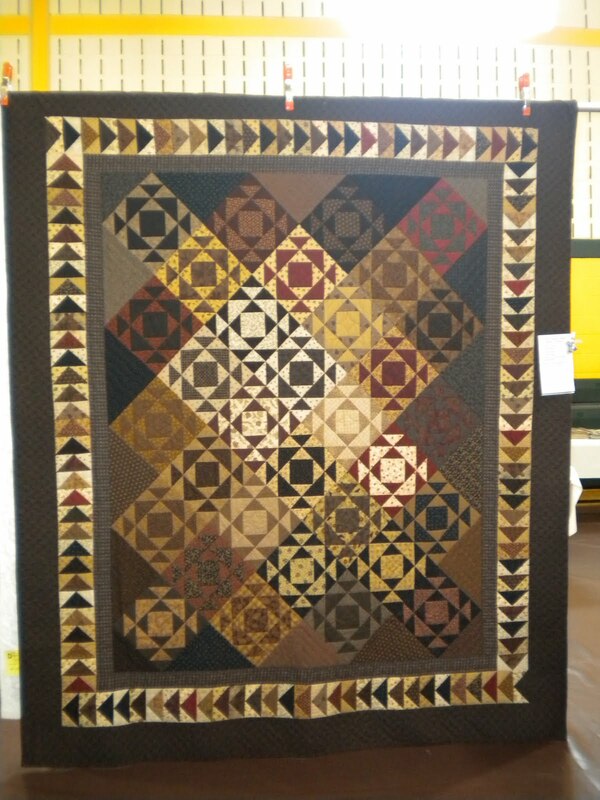 If you would like to see more of Zlaty's quilts you can view them on her blog. I wanted to share some of the highlights from Quilt Odyssey with you. It was great to see so many of you there and getting a chance to stop and chat with you. There were so many beautiful quilts there. There were so many beautiful quilts. I took many pictures since I only had 15 minutes to see them! I figured I could study them when I got home and looked at the pictures. Pat and Arlan Christ's antique quilts were even more beautiful in person. You can find out more about their quilts in a previous post. One of the biggest highlights for me was being able to attend a lecture by Bonnie K. Hunter. It was her Scraps and Shirttails lecture. It was wonderful! It was great to meet her and to see her quilts up close and personal. Unfortunately, I did not get the best pictures, so I will show you 2 of the better ones. This quilt says "The fabric food chain". Too funny, but true! We had a great time in Hershey! I will share more in my next post, but I wanted to be sure and let you know who won our challenge which was on display at Hershey. Congratulations Tricia! She is the winner of this year's challenge "Thinking Outside of the Box". Everyone did a super job! I know it was very tough for people to vote since they were all so different and great looking, I might add. 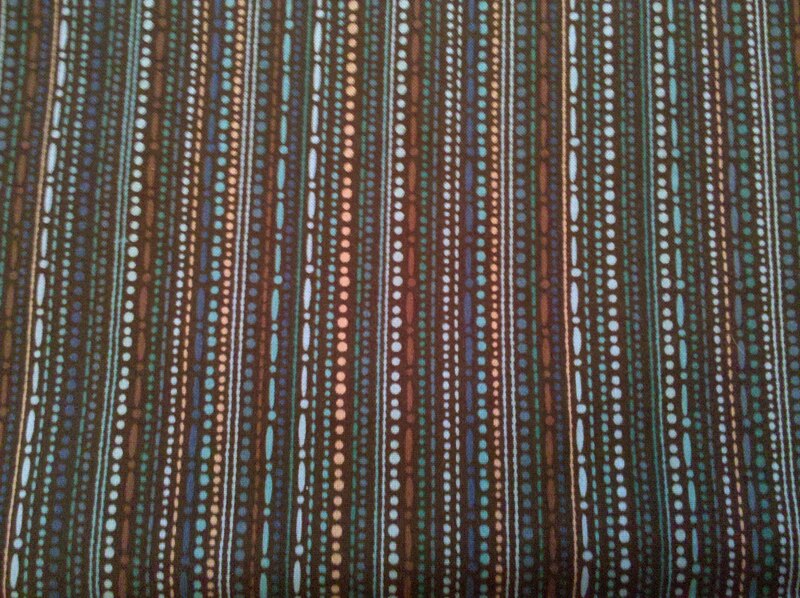 My hubby chose our challenge fabric for next year. We will all be using the same fabric this time. It is called texas wildflower by Michael Miller. 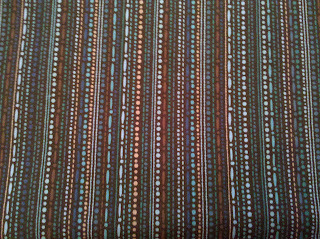 It should make for some very interesting quilts! You can find pictures of all of our challenges in the previous post. Next post I will share pictures of the show. In our booth at the Quilt Odyssey Show in Hershey, PA, we will be featuring a challenge display “Thinking Outside of the Box”. Those of us that work the booth decided to do this challenge last year while we were working at the show. We each had a half yard piece of fabric chosen for us that was not our normal fabric selection. We could use that fabric and add whatever we wanted to in order to complete our quilt. Our goal was to have it finished by this show and then display it and ask for your help to vote for your favorite! Each one is so different! The fabric is shown with the challenge made from that fabric. I hope you will stop by and vote and that you will enjoy seeing what we came up with! I am a huge Bonnie K. Hunter fan! 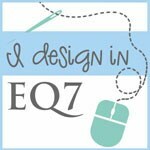 A friend of mine introduced me to her website a few years ago and my view of quilts has never been the same. I have always loved scrap quilts, but I mainly did coordinated quilts or coordinated scrappy quilts. 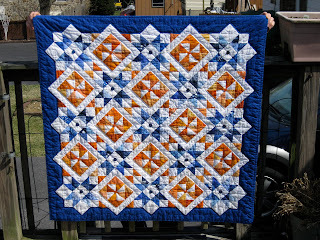 Bonnie has taught me that anything goes and makes the quilt even better! 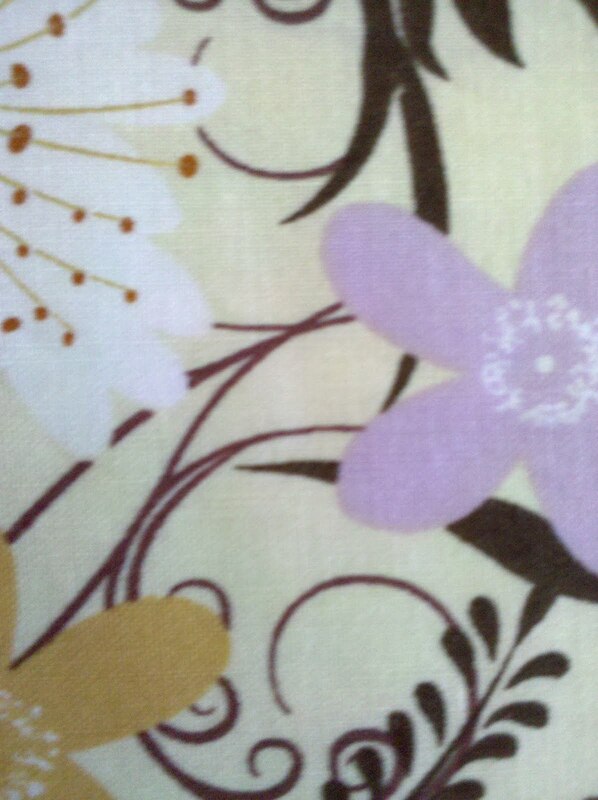 By mixing so many fabrics, it adds more interest, texture, light and shading. She has a fabulous website which you can check out here! 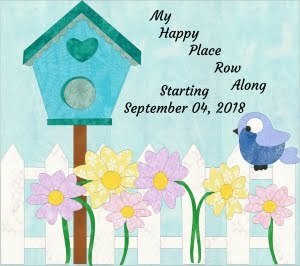 She has many free patterns and tips and techniques available on her site. Her 2 books are great! They are Scraps & Shirtails and Adventures with Leaders & Enders! I own both and really love them! This is the first Bonnie Hunter quilt that I made. It was called Orange Crush Mystery. If you join the quiltville yahoo group you will be notified of any mysteries that Bonnie will be doing. One of the great things about doing her mysteries and using her colors, you get to play with colors that you would not normally use. The second one was Double Delight Mystery. I did not use the same colors this time, but had so much fun doing it. I still need to finish the border on it. I just laid it along side of the center so that you can get an idea of how it will look when it is finished. This was the Christmas Lights Mystery featured in Quiltmaker magazine. I still need to put the borders on it. The green fabric used in the stars was a reproduction Christmas print which I always wanted to use and I thought this would be the perfect project for it. This is Jared Takes a Wife. I only have some blocks made so far. It will be a small wall hanging with 9 blocks. This is from the pattern Sister's Choice. I had great fun using an embroidery design in the center and mixing reproduction prints with batiks. Years ago, I never would have done that, but I love it! This is called Bow-Dacious from Bonnie's Adventures with Leaders & Enders Book! I love bowties and had to make at least a small wall hanging. Of course it needs to be quilted yet. I'm a little slow on finishing some things, which you may have noticed. However I enjoy them just the same! This sample will be hanging in my booth at Hershey. My friend Melissa made this sample Crabapples from Adventures with Leaders & Enders and it will also be at my booth. I love the mix of fall colors and the trees in the corners! 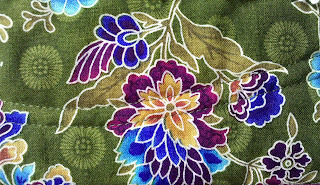 Bonnie is teaching at the Quilt Odyssey Show in Hershey PA which runs July 22-25, 2010. I would be thrilled to see her there. I can't take her class, but maybe I will be lucky to see her in the vendor marketplace. 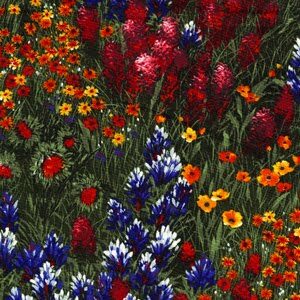 If you read this Bonnie, thank you for your inspiration, patterns and love of antique quilts. You have taught me to have even more fun with making my quilts! Today was Club Day. What fun we had! It is always great to see everyone and chat and share ideas. Eleanor was a sweetheart and made this table runner from a new border stripe, that just came in, so that I would have a sample for Quilt Odyssey in Hershey, PA. My DIL, Zlaty showed her how to make it. Karen is working on this applique block for a quilt for the Schuylkill County Quilters Guild. Beautiful! 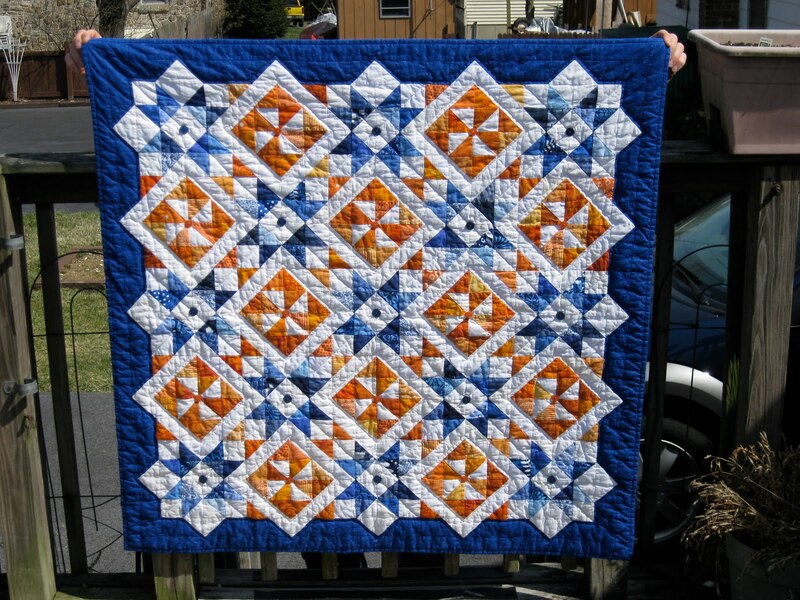 Carol shared this wonderful pumpkin wall hanging and a beautiful star quilt! Sue and Karen turned in their blocks for the Christmas Surprise Drawing! Aren't they great! Melissa just finished this Apple Jacks Sample. So cool! Just in time for Hershey, too! Trisha finished this quilt top so that I could use it at the Quilt Odyssey Show in Hershey. It looks great! Pat shared a new book that she and her hubby Arlan have just published called America's Appliqued Quilts - A Treasured Pennsylvania Tradition. 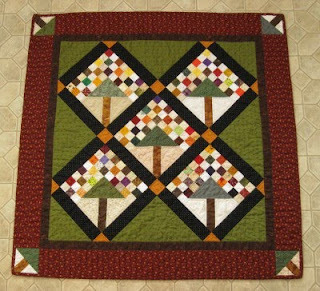 Pat and Arlan have been collecting quilts for years and are now sharing their love of these quilts by lecturing and doing special displays of their quilts. This special collection of quilts will be on display at Quilt Odyssey in Hershey PA July 22-25, 2010 at the Hershey Lodge & Convention Center. I hope you get a chance to see these beautiful quilts! I am so blessed by wonderful family and friends. Thanks so much for all you do! Angie & Sue are checking out the purse that Sue made. It turned out great! I love all the pockets! Judy made a cute teapot quilt! Did I ever mention that I love teapots! Wonderful job everyone! We have such a talented group of ladies! Jo Ann stopped by and showed me a quilt made by the confirmation class of the First United Methodist Church in Schuylkill Haven, PA. They did a super job! I love how they did the blocks and the colors! The beginning of June, my hubby and I went to the Colonial Quilter's Guild Quilt Show in Palmer, PA. It was a lovely show. Here is a sampling of some of the quilts!